You saw the news: Bradley Manning for his role in releasing classified documents to WikiLeaks was acquitted of "aiding the enemy" by a military judge, but convicted of a number of other, lesser charges. He could be faced with as much as 136 years in jail. Julian Assange, founder of WikiLeaks: "This is the first ever espionage conviction against a whistleblower. It is a dangerous precedent and an example of national security extremism. It is a short sighted judgment that can not be tolerated and must be reversed. It can never be that conveying true information to the public is 'espionage'." Reporters Without Borders : "The verdict is warning to all whistleblowers, against whom the Obama administration has been waging an unprecedented offensive that has ignored the public interest in their revelations. It also threatens the future of investigative journalism, which risks finding its sources drying up." Amnesty International's Widney Brown: "The government's priorities are upside down. The US government has refused to investigate credible allegations of torture and other crimes under international law despite overwhelming evidence. Yet they decided to prosecute Manning who it seems was trying to do the right thing - reveal credible evidence of unlawful behaviour by the government." Manning, of course, was subjected to extremely harsh detention conditions starting shortly after his arrest in 2010, including an 11-month stint in solitary confinement. He has been in maximum security prisons for three years – an extremely long and questionable pre-trial confinement. Certainly Manning broke laws and should suffer some sort of punishment. But it's hard to argue in support of the government's extreme actions in the case. Manning's leaks were, at worst, embarrassing to the government, and often downright revealing of its semi-legal actions in the Iraq War. And yet the U.S. government treated Manning like a terrorist, stripping him of his constitutional rights, holding him in indefinite detention, and then pursuing his case with extreme prejudice. 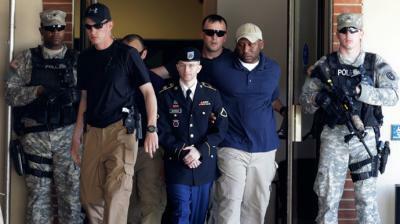 It's hard to find fault with the arguments about the government's harsh treatment of Manning. There are currently protections for federal whistleblowers, but only if the disclosure of information happens within certain government channels. It is easy to see how whistleblowing about classified information on questionable policy -- even if its classified status is questionable -- wouldn't get very far. Obviously these issues are also pertinent to the case of NSA whistleblower, Edward Snowden. Here's the thing: what Manning and Snowden leaked were absolutely pertinent to the public interest. What they revealed is that there are secret government programs and diplomacy going on that are very questionable ethically, and could even be considered contrary to our best national interest. By prosecuting these whistleblowers – especially under charges of espionage – the government is not only discouraging insightful and penetrating journalistic coverage of its actions, it's also conflating its own interest with the nation's. That's not what I learned school. Our government is supposed to be representative of our people, and it should constantly be scrutinized and questioned.